The Saturday Big Tent Wedding Party by Alexander McCall Smith, a Mysterious Review. Review: Domestic matters are forefront for Mma Precious Ramotswe, owner of the No. 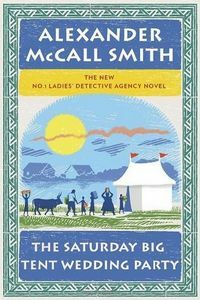 1 Ladies' Detective Agency in Botswana — though there is that strange case of the cows being murdered — in The Saturday Big Tent Wedding Party, the twelfth mystery in this series by Alexander McCall Smith. Even before she's asked to investigate how the cattle came to be killed, Mma Ramotswe has her hands full. She's puzzled by visions of her old white van, a vehicle of which she was especially fond, and misses like a lost friend … if such a thing can be called a friend. Then there's Charlie, an employee of Tlokweng Road Speedy Motors, who has just become the father of twins — and has run off to avoid taking responsibility for them — though Mma Ramotswe hopes her husband, Mr. J. L. B. Matekoni, will deal with that particular little problem. And, of course, there's a wedding to plan: a date has been set and preparations are being made for Phuti Radiphuti to marry Grace Makutsi. In spite of all this activity, as "the lady to help people", Mma Ramotswe — the only female private investigator in Botswana — has a job to do. She is approached by Mr. Botsalo Moeti, a former miner and now the owner of a small family farm, who tells her that two of his cows have had their legs cut and been poisoned … and he fears the same may happen to him. The mysteries in this series are enjoyed more for the delightful characters, their respective life experiences, and, to a lesser extent, the unusual setting in which the storylines play out, than for their crime plots, which are typically of the non-violent sort. The Saturday Big Tent Wedding Party fits this description perfectly. The crime itself is something of a puzzle for Mma Ramotswe … until she considers the possibility that the truth behind the deaths of the cattle was rather different from the story told to her by Mr. Moeti. (One would think that the first rule for being a private investigator is, the client doesn't always tell the truth.) It takes a little long to get to this realization, but once there the case practically solves itself. Or maybe not. Still, The Saturday Big Tent Wedding Party isn't written to be a whodunit, and the resolution to Mma Ramotswe's investigation is a satisfying, if ambiguous, one. Readers who have come to enjoy the entries in this series will not be disappointed with this one. Acknowledgment: Random House provided an ARC of The Saturday Big Tent Wedding Party for this review.